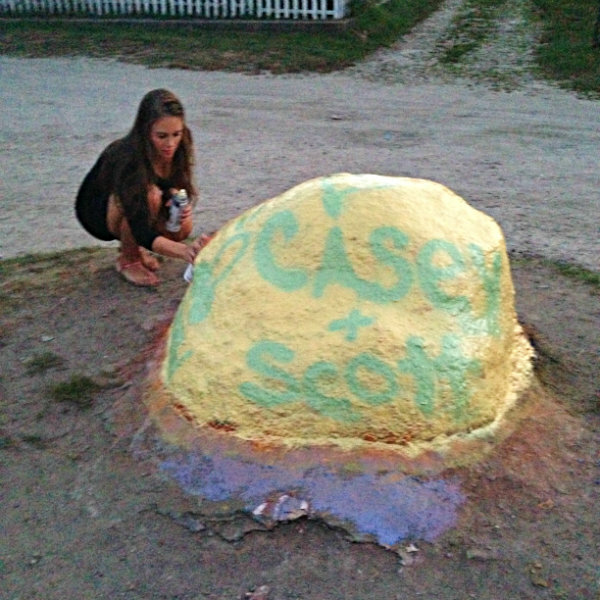 The lovely Brandy painting the rock on Block Island. I do have two very helpful, very hard rocks — my groom-to-be and my momma — to keep me in check. But, late at night, when I’ve been tossing around for hours wondering how we’re going to light up the dessert table or if I should scrap solid design plans for a new Pinterest obsession, I feel a little lost. Buried deep beneath all the errands and worries and projects (and full-time jobs), there’s a little bit of free time. Granted, most of it is spent guiltily running through lists of unfinished tasks; all roads lead back to the big day. When my fiancé and I got the opportunity to go to Block Island last weekend with my parents, we knew we’d talk wedding but we’d also have some fun in the sun, too. Little did I know, a group of girlfriends had sneakily planned an all-out bachelorette party, complete with painting the infamous Mohegan Trail rock (immediately after another group had painted it; poor form? ), a surprise dance party with sushi, pizza bread and Jell-O shots, an ungodly amount of phallic paraphernalia, presents, pictures, sparklers, a few afros, a pair of grill tongs and a night out on the town filled with loud singing and on-stage dancing. It’ll go down as one of the best nights — and it couldn’t have come at a better time. Casey Nilsson is the copy-editing extraordinaire for Rhode Island Monthly magazine. She’d like to marry her dreamboat, throw a personal, romantic reception and avoid angering any immediate family members — in less than eight months and for $8,000. Can she do it? Follow her thrifty, DIY journey here or on Pinterest @cnilssonRIM.